Which Rookie Quarterback Had The Most Poise After His First Start? As poorly as he played, Weeden never seemed to lose his poise. You saw the poise he carries himself with. ...sacked three times, but did flash arm strength and poise in the pocket. Hartline called Tannehill's poise and demeanor "phenomenal." ...as polished and poised as the original. Luck wins! 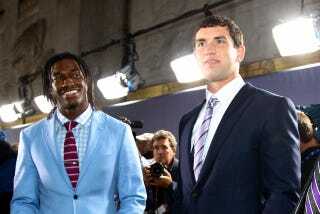 If there were a poise draft, it looks like Andrew Luck would be picked first overall in that, too.